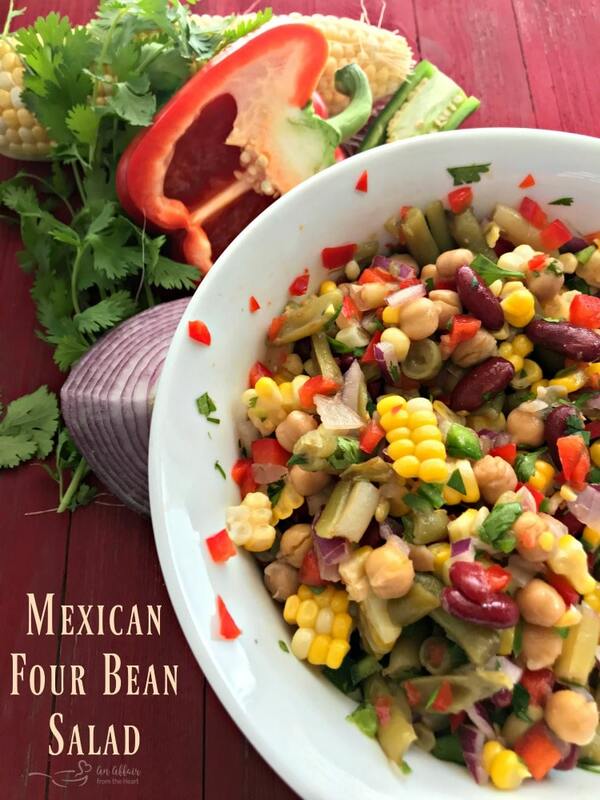 Paisley Farm Four Bean salad gets a Mexican twist with a couple fresh herb and veggie add-ins. Great all by itself, or delicious on grilled chicken! This salad is perfect to kick off grilling season, and would make a great addition to your Mother’s Day feast. Mom’s love fresh veggies, colors and tons of flavor. Make up a quick batch of this Mexican Four Bean salad as a side, or use it to top fresh grilled chicken. Mom will be happy you did! This post has been sponsored by Paisley Farm Foods, but the opinions and the love of their Four Bean Salad, and all of their wonderful products are my very own. Thank you for supporting the companies that make An Affair from the Heart possible. After the very VERY long winter we have had this year, I believe we have finally turned the corner, and it’s time to fire up the grill, gather around the patio with family and friends and celebrate sunshine and warmer weather! I know that there is no way I would rather spend my Mother’s Day than to be surrounded by my kids, and my family, soaking up the sun and enjoying a dinner prepared for me on the grill. Paisley Farm makes side dishes easy. They have SO many to choose from. 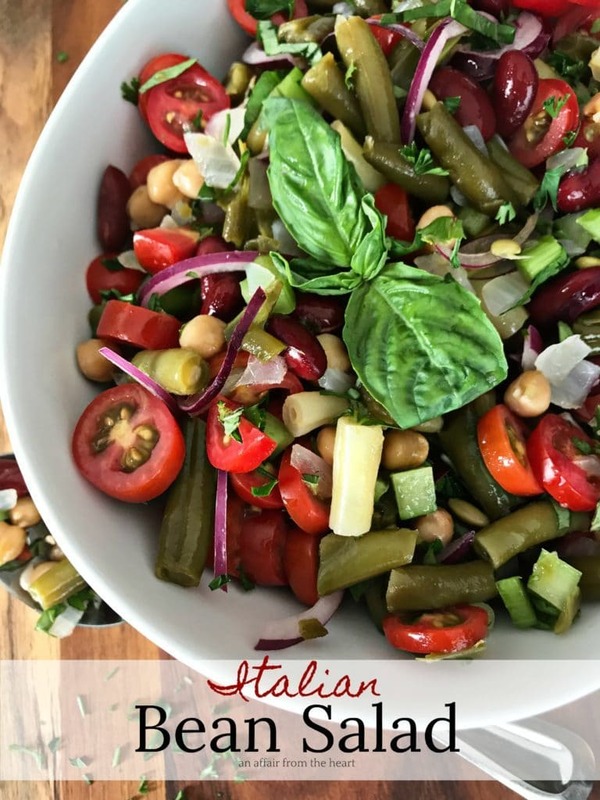 It’s as simple as twisting off the lid to adding a couple of things to give it a new twist, like we’ve done today, or like my recipe for Italian Bean Salad. ITALIAN BEAN SALAD Four bean salad gets an Italian makeover with the simple addition of some fresh herbs, veggies and tomatoes. It doesn’t get much easier, does it? 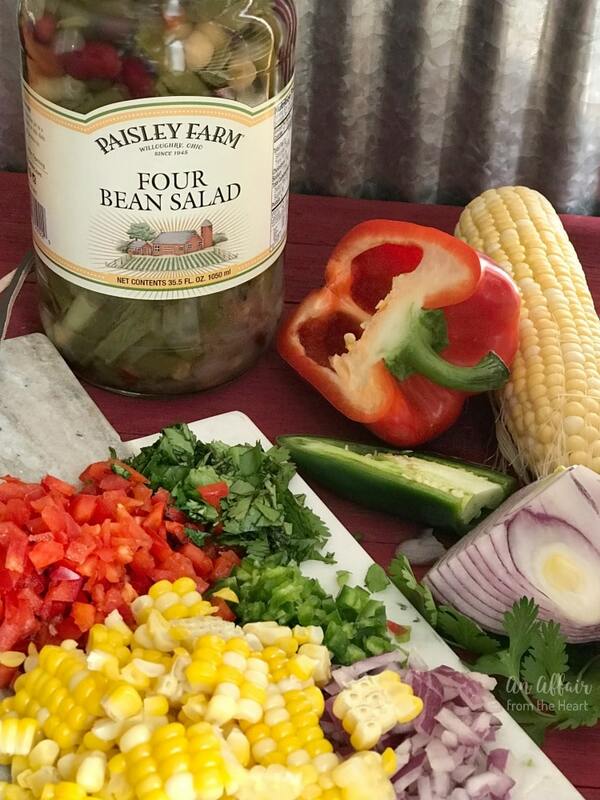 Pop open a jar of Paisley Farm organic Four Bean salad, add a few fresh ingredients of your choosing to give the already amazing flavors a twist, or just eat it straight from the jar, there’s no judgement. Right now the shelves are stocked with Paisley Farm Four Bean Salad. It’s available at Sam’s, Costco and Walmart to name a few. Can’t find it in your area? Check out where it’s available, or have it shipped right to your door! 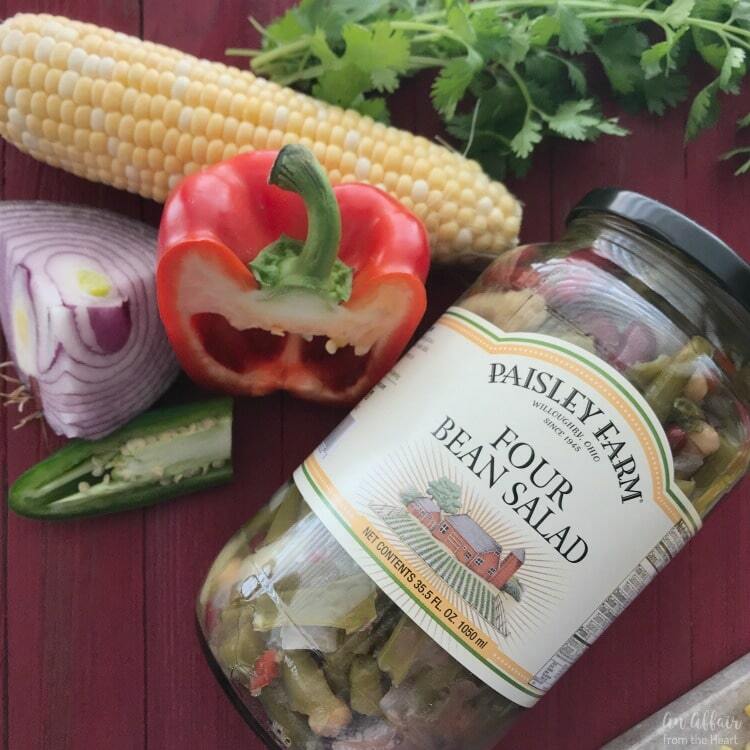 Paisley Farm Four Bean Salad is a sweet blend of kidney, garbanzo, green, and wax beans accented with freshly diced onions and red peppers. It’s convenient straight from the jar goodness makes this one of their most popular items. 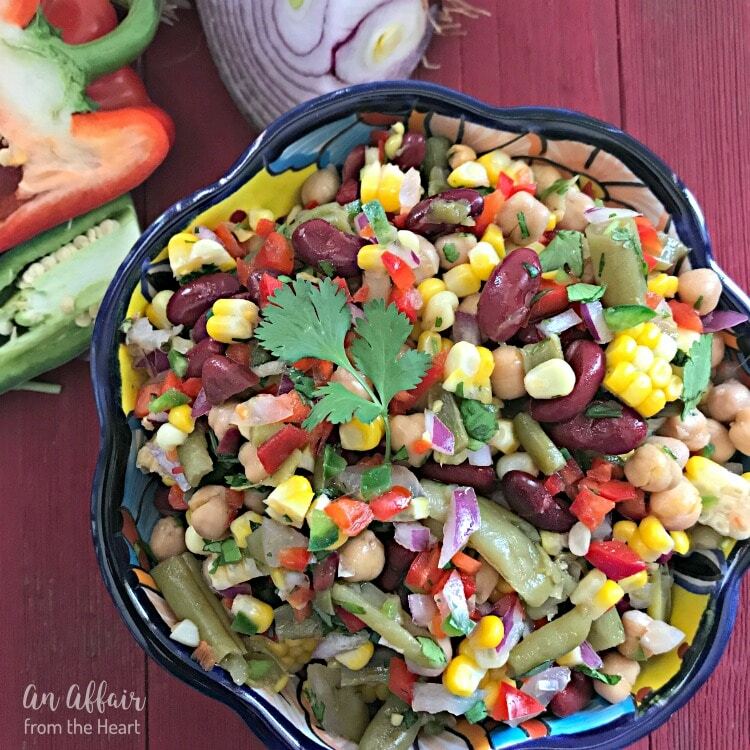 Paisley Farm Four Bean Salad is colorful and delicious and can be served and enjoyed from gourmet table settings to summer picnics, and everywhere in between. 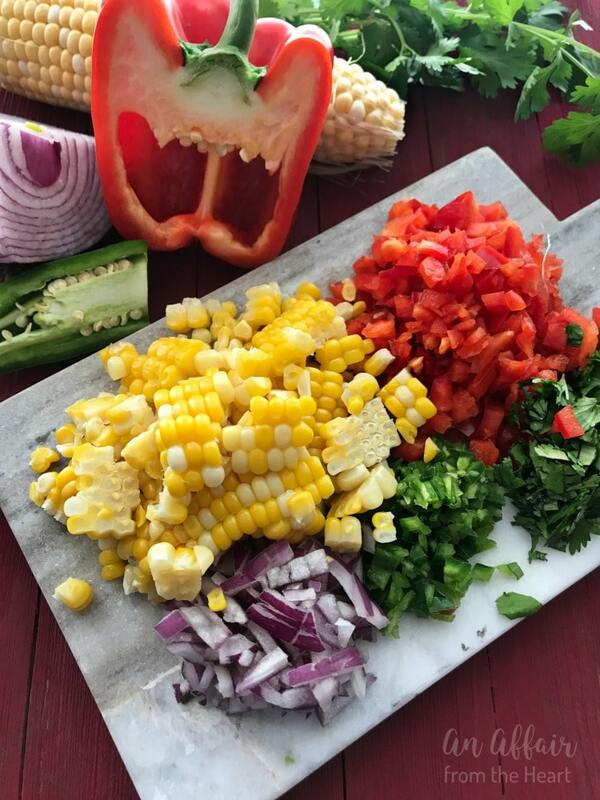 For this recipe, we have used Paisley Farm Four Bean Salad, chopped jalapeño, red onion, red bell pepper and cilantro. We added in some fresh sweet corn, right off the cob, and Voilà! A fresh and delicious salad that took me no longer than 5 minutes to prepare. It was good right away, but the next day? After all of those flavors had a chance to marry together? YUM!! May has been deemed “National Grilling Month” — we need to embrace this time of patio feasting, am I right? 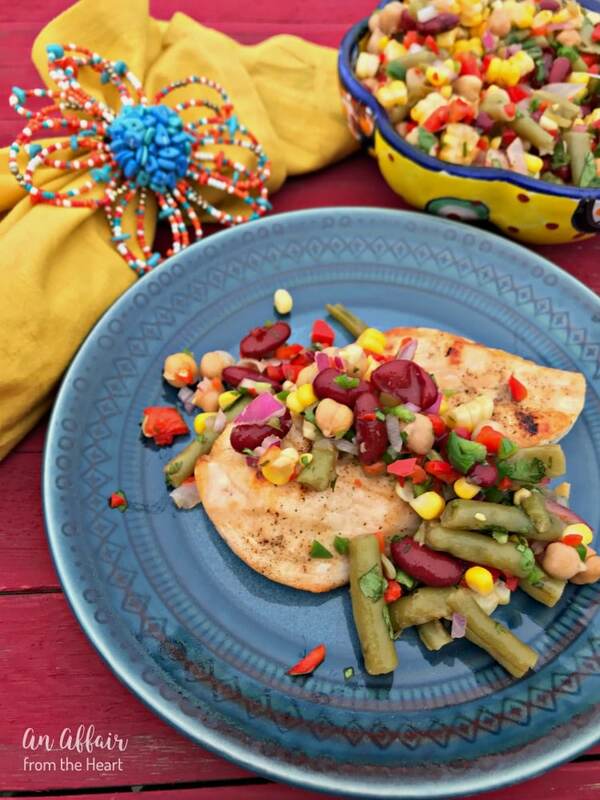 This Mexican Bean Salad not only tastes amazing eaten as a salad, but guys, over a grilled chicken breast? Oh, MY! Super easy – Super good – QUICK meal with TONS of flavor! I mean really? How long does it take to grill a chicken breast? A little salt and pepper, a few minutes and done. Get this Mexican Bean Salad in your fridge and give it a try this week. You can be sitting down to this meal in like 15 minutes, friends. I hope you give it a shot and come back here and tell me what you thought. A bed of baby spinach leaves, topped with Paisley Farm Four Bean Salad, thick bacon, crunchy brussels sprouts, ripe tomatoes, hard boiled egg, olives and red onion all topped with the creamiest homemade roasted garlic dressing. Check out Paisley Farm’s website for even MORE great recipes and browse all of their amazing products. Paisley Farms on FaceBook, Instagram and Pinterest. How will you serve this Paisley Farm Italian Four Bean Salad? Let us know! Let’s make some Mexican Four Bean Salad! Combine all ingredients in a bowl. Chill until ready to serve. your bean salad looks super scrumptious and I cant wait to try this! This is so pretty and vibrant! I love that it features jalapenos! And I could see that it is easy to put together. Thank you for sharing, Michaela! I can’t wait to make it! 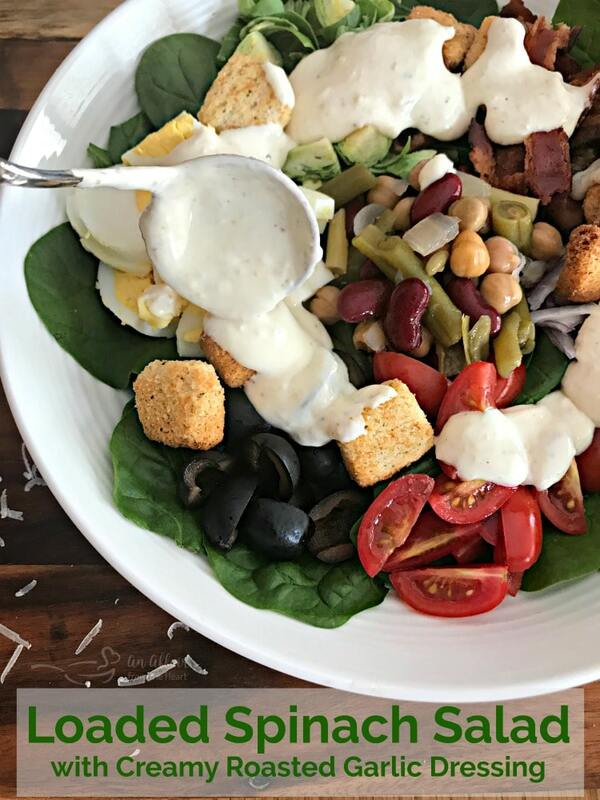 This simple and delicious looking salad is perfect for this summer’s onslaught of family reunions, graduation parties, potlucks and so much more. I love the dancing flavors of this beautiful recipe. Thanks for sharing! Oh, yes! This bean salad is perfect for a cookout. Adding this to my menu to serve with a classic burger! 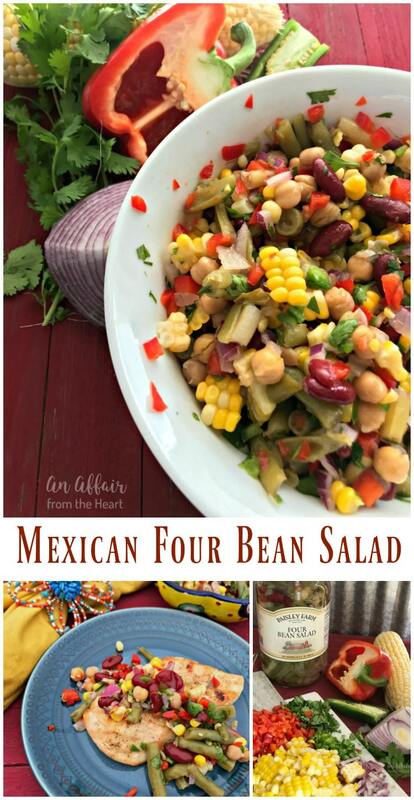 Love that you used that already great bean salad and but the Mexican flavor twist in there!! This is a perfect summer grilling side dish! Cant wait to make it!!! You weren’t kidding.. this tastes great the day you make it, but letting the flavors meld overnight is a game changer! Not a bite left after our BBQ, it flew off the buffet! I love that this salad comes together in just 5 minutes! It looks so delicious and will be perfect this summer for any picnic or BBQ! This is my go-to salad, right here! All of these flavors are so perfect together and is the perfect side for grilling weather! Which I am so glad is finally here! I love that bean salad right outa the jar, but you’ve doll’d it up and took it to a new level of delish! Can’t wait to give this a try!! I have loved bean salad since I was small as my Ma used to make it. She also made me chili and spaghetti to go with it too! I love the Mexican twist on it!! Mmm This MEXICAN FOUR BEAN SALAD looks great! It so perfect for a picnic!! !